So… a few of us got together yesterday for an informal meetup of DC residents that own One Laptop per Child (OLPC) XO laptops through the Give One Get One Program. 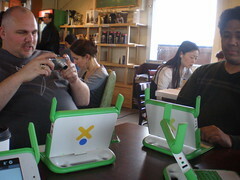 It was great fun to meet other people who were excited about OLPC. We talked through some issues that people were having with their laptops. We showed the computers to other people at the coffee shop. We played some games using the mesh network. …we have also greatly broaden the community of participation in the project. The community has already jumped in to help: the level of activity in our forums, IRC, email lists, wiki, etc. has risen dramatically over the past few weeks. G1G1 participants have asked lots of questions—and have uncovered some new bugs—but they also have lots of answers—and have submitted some new patches. The community model seems to be scaling. You too can participate but you only have till tomorrow. 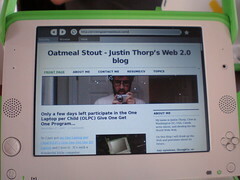 The OLPC Give One Get One (G1G1) program ends tomorrow, December 31st.